So it’s been 66 months since my radical prostatectomy. How am I doing? Honestly? Scared. Afraid of the cancer coming back. 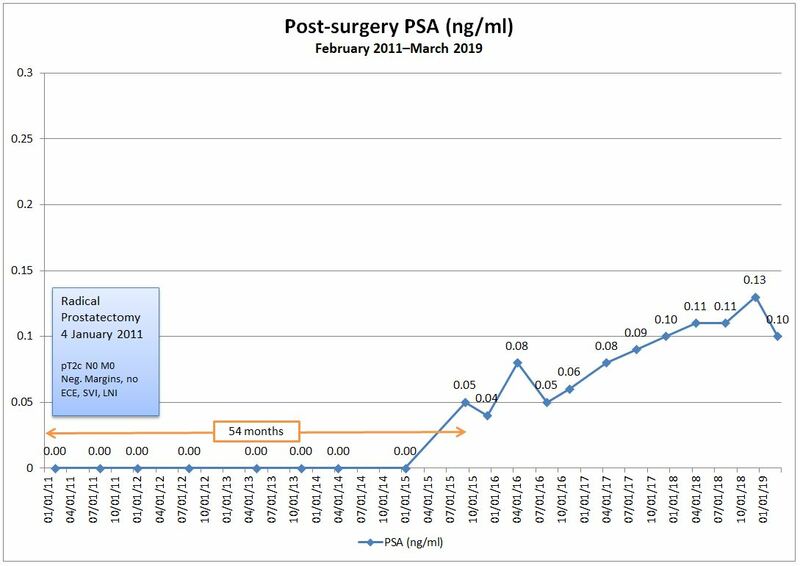 Since my 60-month update in January, we learned that my PSA doubled from what it was in December 2015: 0.04 ng/ml to now 0.08 ng/ml in April 2016. That’s still below the recurrence threshold of 0.2 ng/ml, but obviously moving in the wrong direction. In four weeks, I’ll go for another PSA test and we’ll just have to wait and see what happens with it. Yep. There’s been plenty of emotions in the last six months. When I saw the PSA at 0.08 in early April, it was as though I was knocked off a horse, fell to the ground, and had the wind completely knocked out of me. Dazed, confused, and not even sure that I wanted to try and get up. It took until early June before my emotional response subsided and I got back into a more normal mindset. I continued with my weight loss program (90 lbs. / 40.8 kg), and that has certainly helped with my incontinence. Very rarely do I have any leakage at this point. I’m so sorry you’re going through this. You were pretty sure you were in the clear and now things are up in the air. It isn’t fair or right. It just is what it is. It sounds as if you have a good medical team and you PSA is still very, very low. You may dodge this bullet. I hope you can learn to focus more on the present to take away most of the fear of the future. It would serve you well. I’ll continue to think of you and pray for you. Why do they only have “Like” buttons. They could do with “Dislike” and “Sympathise” and possibly a few more. At least you are not in the 2% (although I guess this would be an amazing blog if you were! ).